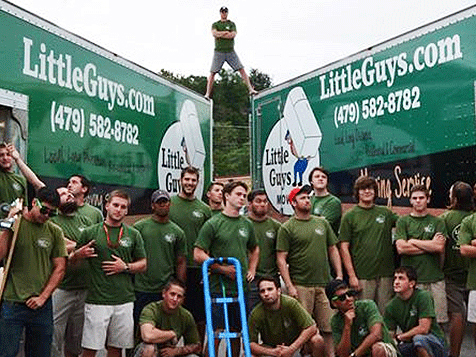 What does a Little Guys Movers Franchise Cost? 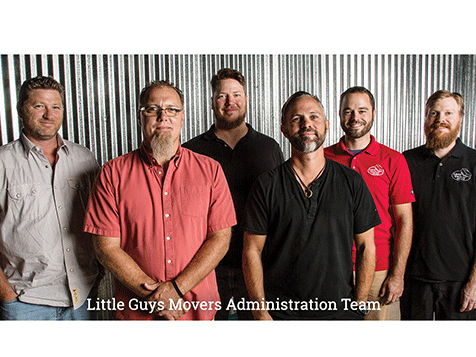 After more than 20 years of successfully building a professional moving business from the ground up, we are excited to offer Little Guys Movers franchises. Our company is the perfect combination of having a fully-developed, proven system (24 years, 13 stores) and plenty of room left to grow. 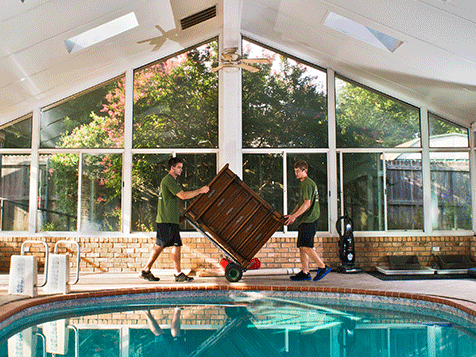 There are numerous available markets that need a professional moving company like Little Guys Movers, and we encourage you to own and operate multiple units. We can teach you everything you need to know to run a successful Little Guys franchise… everything except how to work hard and be honest. Become a franchise owner and join a company that cares about its customers, employees, and local communities. Open Little Guys Movers in any of these available states: AL, CO, FL, GA, IN, MO, NC, OH, SC, TN, TX. 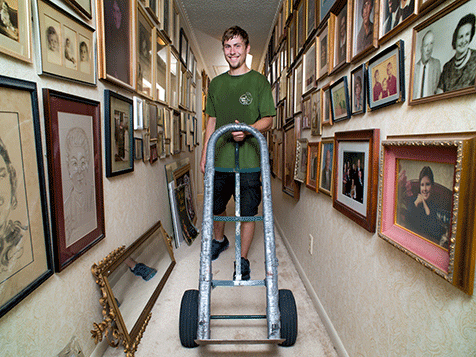 While owning a moving company might not seem like the most glamorous option, consider that a franchise with Little Guys Movers means a chance to build something great. It’s a place where you can shape young lives to be great employees and citizens; where you can help customers through difficult situations and develop lifelong relationships. It’s an opportunity to get deeply involved in your community to make a difference, and to have a lot of fun while doing it. According to the American Moving & Storage Association, Americans spend about $10 billion a year on moving and packing services. Sure the moving industry at large doesn’t have the best reputation, but this provides a great opportunity for you as a dedicated franchisee to stand out by doing business the Little Guys way. We work hard to get the job done and do right by people, a philosophy that’s reflected in what our customers say about us. Our company is the perfect combination of having a fully-developed, proven system (24 years, 13 stores) and plenty of room left to grow. There are numerous available markets that need a professional moving company like Little Guys Movers, and we encourage you to own and operate multiple units! (We aren’t just a franchising machine, by the way – we walk the walk by owning and operating our own stores too.) While we really believe in our program and know that it can work almost anywhere, our ideal markets provide a constant stream of customers and employees. City populations of over 50,000 and serviceable areas of 300,000 and up tend to be the sweet spot. Since 1992 we’ve worked hard to develop a unique and detailed system for operating our stores. We can teach you everything you need to know to run a successful Little Guys franchise… everything except how to work hard and be honest. Because we believe that you can’t sell and manage what you don’t understand deeply, our training process involves six weeks of intensive training on everything from moving techniques to computer systems. After that we provide ongoing support and training, because like we said, this is a tough business and we want to ensure your success while also maintaining the high standards our company is known for. What are the financial requirements to open a Little Guys franchise? Most franchisors look at liquid capital, net worth, and the like. These things are important to us, but not as important as a compatible mindset, positive attitude, and a do-or-die work ethic. We want to see a combined credit score of 700 or higher and proof that you will be able to secure the financing to get your shop rolling. If you think you’ve got what it takes, we’re interested in talking with you about your unique situation. 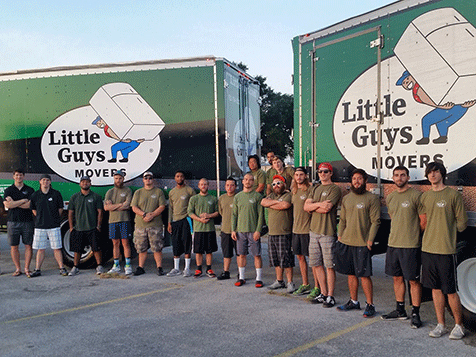 Little Guys Movers franchise fee is $30k (25% less for veterans). Do I need experience in the moving industry? Absolutely not, in fact, we prefer that you don’t. Bad habits can be hard to kick! How much does it cost to actually get a shop up and running? Depending on the market size and lease rates in your area, the cost of opening a shop generally varies between $80,000 to $200,000. How long does it take to get open? Once an agreement is signed it should take approximately 3-6 months. Training lasts six weeks, but depending on inventory (available and viable locations), site selection can take some time. Does Little Guys provide financing? At this time, we do not provide financing, but we are working to find the best options to provide financing soon. How much are royalties and how are they calculated? What is a Brand Development Fund and does Little Guys have one? A Brand Development Fund is an additional 2% fee that, if implemented, would be used for many different development concepts, benefitting all locations and the Little Guys brand as a whole. Little Guys Movers is not currently implementing a Brand Development Fee. How long does it take to start turning a profit? Federal regulations handcuff us a little on talking about potential earnings, but we like to see a store running full blast in under three years. Once again, the Feds make us bite our lips on making any guarantees about earnings and profits, but we would encourage you to talk to one of our current franchisees, who can share openly about these things. We are happy to help get you in touch with them. Who chooses the city and building location? Since we will be partners, we will all have to agree on the city, the area in that city, and the specific facility. This can be a really fun part of the experience; it allows us to spend time together and make the best decision regarding your new shop! Do I have to buy my equipment from Little Guys or can I get it anywhere? While we will steer you in the direction of our preferred venders, Little Guys Movers does not require you to buy anything directly from us. This is another really cool part of the experience. We have both classroom-style fundamental training and real-time training at an existing shop that includes field and office experience. Yes, you are definitely going to do some moving! Once I get my shop open, am I on my own? Yes, once you are up and running you will never hear from us again. Just kidding! We have a national office of experts who will monitor your progress and counsel you on the many moving parts of the system as we go forward. The feedback loop is two-way, which means if we see something going wrong, we will tell you, but likewise if you have a question or a concern, we are always available. Video conferencing has become a staple that we rely on often. How long is the franchise agreement good for? A signed agreement is good for five years with three consecutive five year optional renewals. In reality, these terms just allow the agreement documents to be updated periodically to reflect any changes that may have occurred internally, like processes and systems, or externally, like new federal and state regulations or required language. The Franchise Disclosure Document is the agreement that lays out all the rules and regulations of our relationship.